Uighur students study in front of a map of China at the Islam College in Urumqi, Xinjiang Uighur Autonomous Region, October 13, 2005. The campaign began quietly. Students studying abroad were told to return home. Many did, and their classmates didn’t hear from them afterwards. For those who needed extra incentive to get moving, police detained their families back home. Finally, the ones who refused to comply were rounded up by force. 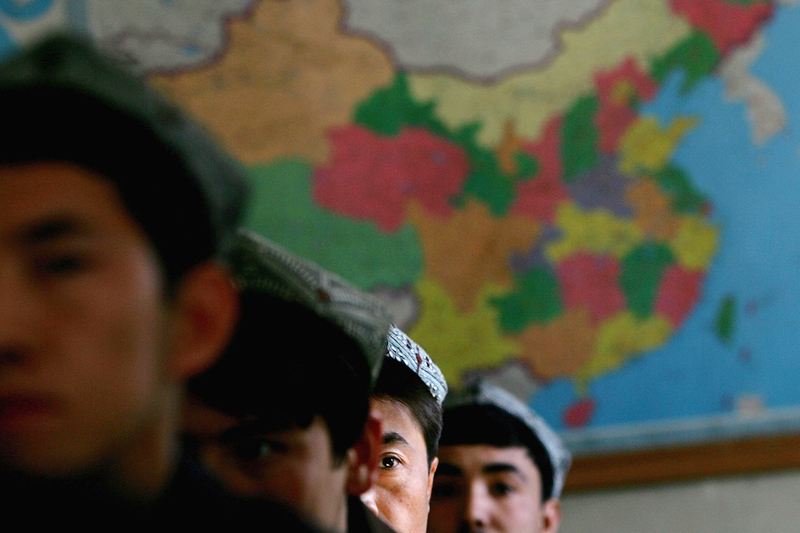 China is seeking out and recalling members of its ethnic Uighur minority population scattered across the globe. In the case of Egypt, Chinese authorities have relied on Egyptian security to seek out and round up ethnically Uighur Chinese citizens in Cairo. Egyptian security personnel have detained dozens of ethnically Uighur Chinese citizens, some of whom have already been repatriated to China. Many details remain unclear, including the legal residential or student status of some of the Uighurs in Cairo. But the People’s Republic of China’s ability to demand the return of whole groups of minority citizens—without a clear and compelling case for their repatriation, and without any semblance of due process—should be worrying to the international community. Silence in the face of this type of extraterritorial action makes third-party nations complicit in these individuals’ return. Silence suggests that any future actions taken in additional countries would also not be condemned; silence lets those countries’ local security forces know that they need not concern themselves with international criticism. Students around the world, including in Egypt, Turkey, and the United States, got the call. Some students’ family members were detained until the students came home. Some of those who returned were reportedly jailed or have simply been incommunicado ever since. One set of parents who returned from Egypt with their child in February were detained and their 12-year-old son put into political re-education; in March, another 17 Uighurs were “blacklisted and punished” after returning to Kashgar. RFA has also reported that one Uighur theological scholar, whose studies in Egypt had been sponsored by the state-affiliated China Islamic Association, was sentenced to 10 years in prison this May after he voluntarily returned last year as requested by People’s Republic of China (P.R.C.) authorities. A spokesperson for the Unrepresented Nations and Peoples Organization said that 90 percent of the estimated 7,000 to 8,000 Uighurs who had been living in Egypt had returned to China this year. This story went largely unreported, perhaps because it was not widely known. RFA itself did not report on China’s calls for voluntary repatriation until May. Then came the recent detentions in Egypt. Egyptian security personnel began rounding up Uighurs—as well as ethnically Kazakh Chinese citizens—who had not voluntarily returned home, a number of whom were studying or had studied at Cairo’s Al-Azhar University. Starting on June 30, Egyptian security officials picked up somewhere between 70 and 200 Uighur individuals in their homes and in restaurants. At least a dozen have been forcibly repatriated back to China, while others have fled to Turkey (though some have been detained as they tried to flee), and still others are seeking asylum through the U.N. High Commissioner for Refugees. A large number of those detained are being held by Egyptian national security services in Tora Prison, where they may also be being interrogated by Chinese officials. The P.R.C. has not publicly addressed the detentions and repatriations. Instead, the Chinese consulate in Egypt held a symposium on July 8, several days after the bulk of the Uighurs had been detained, at which the Vice Chairman of Xinjiang stated that the government had nothing but concern for Xinjiang expats in Egypt and would continue to encourage students to return to China to find work. The event also included a student representative who thanked China for its support. Though the P.R.C. has not issued any formal statements about the repatriations, it is not difficult to imagine that these efforts are tied to Beijing’s concern over its ethnic Muslim minorities linking up with extremists outside China and returning home to carry out attacks. Leaving aside the basis for such concerns, the fact remains that the repatriated Uighurs do not appear to have been accused of any terrorist-related activity. Whatever these Uighurs’ status in Egypt—one man claims to have lived there for 15 years—it is important to remember that they have legitimate fear of persecution upon returning to China. One man told the BBC that Uighurs would rather be in jail in Egypt than be returned to China, because at least in Egyptian prison their religion would be respected. There is no reason to think that China will not continue to press any nation it might see as tractable on the Uighur issue, even if it does not go so far as requesting forcible repatriations. On July 26, at China’s request, Italian police briefly detained Uighur exile and German citizen Dolkun Isa, who was scheduled to speak at the Italian Senate. This follows a similar incident in April in which Isa was removed from a United Nations forum in New York and refused re-entry. Just this month, Turkey, long known as a relatively safe haven for Uighurs leaving China, agreed not to allow “anti-China activity” in Turkish territory and to restrict negative reporting about China in Turkish media. China’s Vice Minister of Public Security, Meng Hongwei, is currently president of INTERPOL, a cooperative international policing organization, which augurs further such incidents before his term ends in 2020. This makes international silence about these events even more chilling. China is ever more willing to pick up the phone and ask for help pursuing ethnic minority citizens abroad. Where are the people willing to refuse?